Situated alongside glorious Bávaro Beach, this re-vamped resort offers 424 oversized luxury guest suites, including 80 exclusive adults-only Royal Service suites with indoor whirlpool and a butler service option, plus 132 new luxuriously appointed Residential Concierge Suites in The Reserve at Paradisus Punta Cana. An eco-conscious resort, it features open-air architecture and magnificent views of the Caribbean Sea. 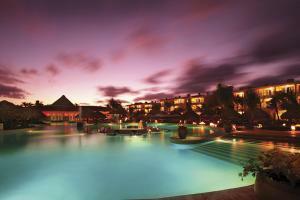 Located beachfront at Playas de Bavaro, and 20 minutes from Punta Cana Interantional Airport. El Romantico - Gourmet French cuisine; Antojitos - Mexican fare; El Marino - Seafood; El Rodizio - Brazilian-style steakhouse; Sakura - Teppanyaki. Saona Island, Manati Park, La Romana, Old Santo Domingo, Columbus Lighthouse, El Alcazar Museum.